So, as you'll know if you're a regular reader, I recently went to London for just under a week. 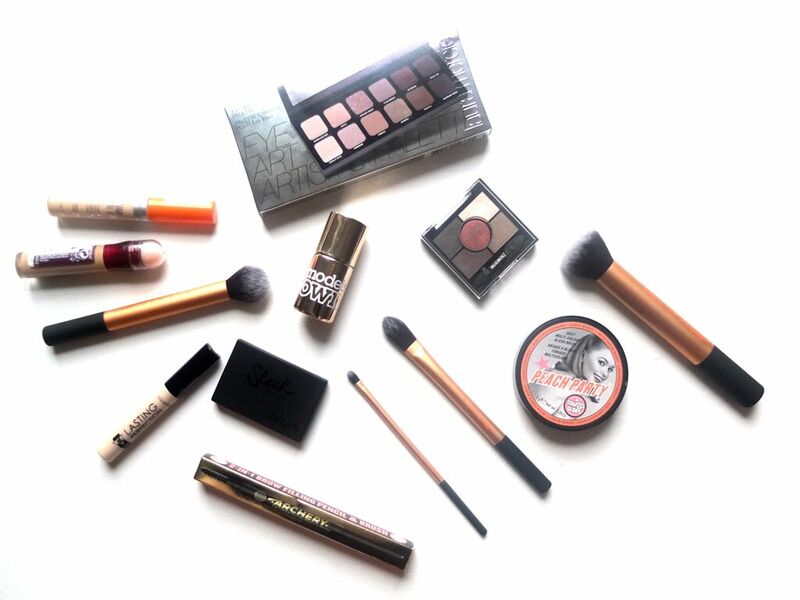 It turns out that just under a week is plenty of time to get some solid makeup shopping done! There are a lot of products that I can't get my hands on here in Zurich, so as soon as I book a trip to the UK, the saving starts. So fuelled by my savings and some early birthday money, I charged through the streets of London. I got quite a good mix of products but I'll tell you right now - I didn't get any lip products - I know, what's happened to me? Despite that, I think I found some great products so here's a look at what I picked up! Okay, so I bought three concealers. Does anyone really need three concealers? Maybe. I never splurge on high end concealers because I seem to get through them very quickly and I'm a student, I really can't afford a £20+ concealer habit. Because of that, I like to get my concealers from the drugstore. I've heard so much about the Rimmel Wake Me Up Concealer, and I really wanted something to use under my eyes. The name of this seemed fitting enough to get the job done, so we'll see how it holds up! Next up is a repurchase of an old favourite, the Collection Lasting Perfection Ultimate Wear Concealer. This is probably my seventh tube of this and it's fair to say that it's definitely withstood the test of time. The final concealer I got was another repurchase, this time of the Maybelline Instant Age Rewind Concealer. Now I am kicking myself because I somehow managed to pick up the wrong shade of this. You can probably already tell from the photo how much darker this is than the others - apparently I'm colourblind when I'm in Superdrug. 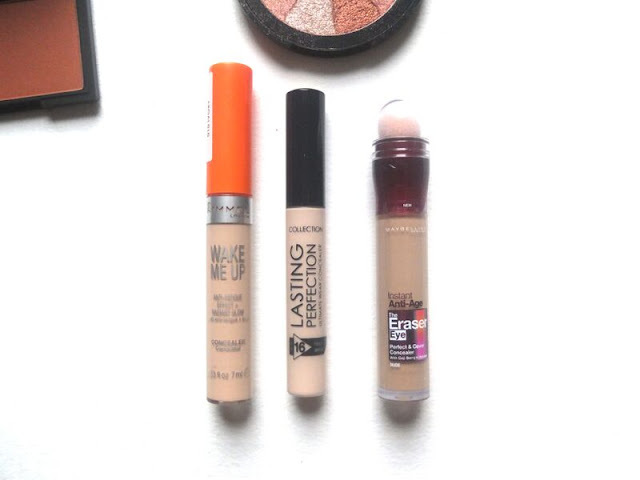 Although I do love this concealer, so I think I'll be saving this one for summer! Onto the blushers. 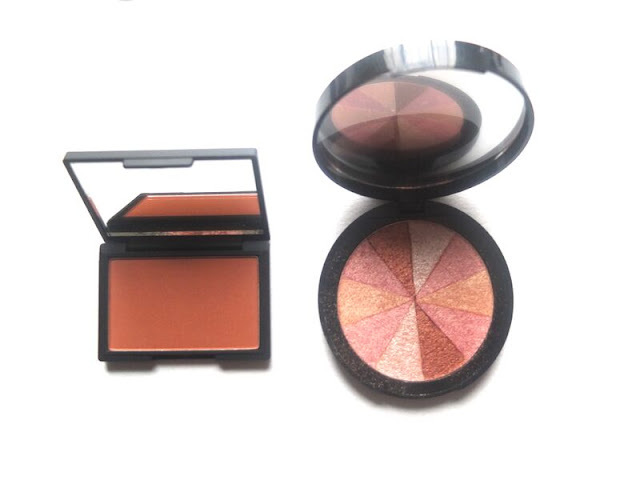 I love blushers, I own far too many and I'm always on the lookout for new shades and formulas. Both of these purchases were enabled by blogger buzz. The first is Sleek's Sahara, a gorgeous burnished orange shade that I'm very much looking forward to using this autumn and winter! I spent a very long time trying to find this, I must've been in about 8 different Boots and Superdrug branches before I found it - yes, I had a lot of free time in London. The second blusher I picked up is the Soap and Glory Peach Party Blush Brick. Now I can't remember who it was, but someone mentioned this making you instantly look like you had a tan. For a perpetually pale-faced gal like me it was like a moth to a flame. I have tried this already and although it looks beautiful in the pan it is extremely shimmery, which I really should have expected, but I'm unsure as to whether this works more as a highlighter or a blush? A highlighting blush? I shall continue to work with it, because let's face it, it's far too pretty to cast aside. Next up are eyes and brows. I'm a big brow product snob, and I've been stubbornly filling my brows in with the same Urban Decay powder shade for years now. 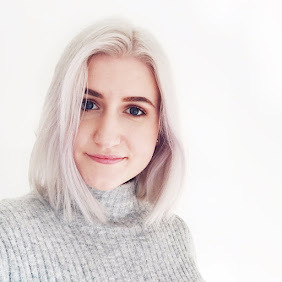 I've had some forays into eyebrow pencils, but they have always been of the drugstore variety (I really don't want to spend upwards of £20 on a pencil) and therefore very odd shades and often very warm toned. I'd heard a lot about the Soap and Glory Archery 2-in-1 Pencil, and I thought I'd give it a try, my expectations at an all time low. I got the shade Blondeshell, expecting it to be weird and orange (the testers had been savaged so it was really left up to the imagination) like many other drugstore brow pencils aimed at lighter brows. However, to my surprise this is very ashy toned and I kind of love it. So much so that I went back a few days later and bought another one to bring back home with me because I don't want to be without it - success! I was bought an early birthday present when I was in Space.NK with my mum. I spotted this Laura Mercier Artist Eye Palette and promptly picked it up. This palette is so gorgeous it really warrants its own post, so let me know if you'd be interested in a review! Last on the eyeshadow front is the little Rimmel London HD 5 Pan Eyeshadow in the shade Brixton Brown. This tiny palette just looked so autumnal to me that I had to pick it up - that red shade! *Swoons". I think I'll be getting a lot of use out of it as it grows increasingly colder and more wintery. Finally, we have nails and tools. I spotted the Models Own Chrome Rose nail polish on Charlotte's lovely blog Charlotte's Road here, and since then I've been keeping an eye out for it. I finally picked it up in Superdrug and I'm chuffed, I love the packaging and the colour is gorgeous - who doesn't love a bit of rose gold? Last of all I finally picked up the Real Techniques Core Collection Kit. I know, I'm probably one of the last people to jump on the bandwagon, but for some reason I just never really got round to picking this set up. 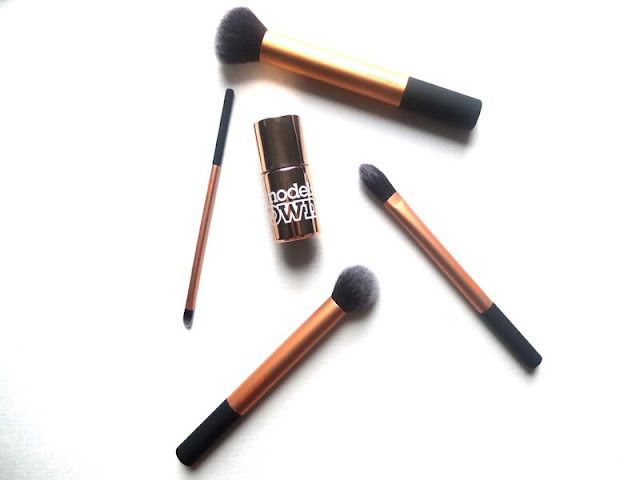 I've tried a lot of other Real Techniques brushes and they're probably my favourite brand for makeup brushes. They're such amazing quality and so affordable compared to other brands that sell the same quality but for many more pennies. These brushes match the amazing quality of the others I've tried so far and they'll make a great addition to my stash! Gosh, this was another long one, wasn't it? I thought I'd kept the beauty shopping fairly tame, but perhaps I was in denial... It was the week before my birthday so maybe that counts? Yeah. Expect some reviews coming your way very soon! 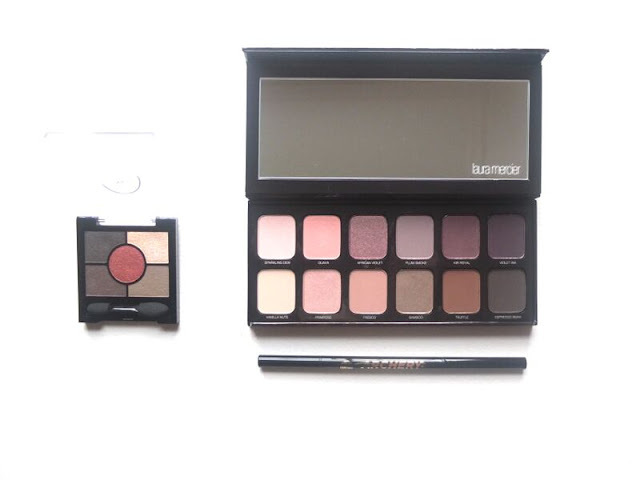 That Laura Mercier palette is so beautiful! You picked up some really nice things. Got some amazing products there! RT brushes are great and really affordable! LM palette looks gorgeous! Woohoo! Great haul. I'm with you on the blushes, love them!